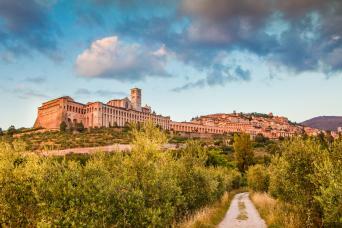 Rollings hills, sharp mountains and historic hill towns characterise a cycling holiday in Umbria. Spend some time in Italy's only landlocked region and you begin to notice how traditions die hard here, the culture maintained through food, music, art and wine. Umbria is referred to as the 'green heart of Italy' and as you cycle through the verdant countryside made up of tilled hills, thick forests, deep valleys and rivers you understand why. Breathe easy as you cycle past vineyards, olive groves and endless cypress trees on a self-guided cycling holiday in Umbria. Enjoy the rich medieval history and enchanting landscape of Umbria, while cycling among rolling hills, vineyards, olive groves and Medieval Hill Towns, symbolic of this region.